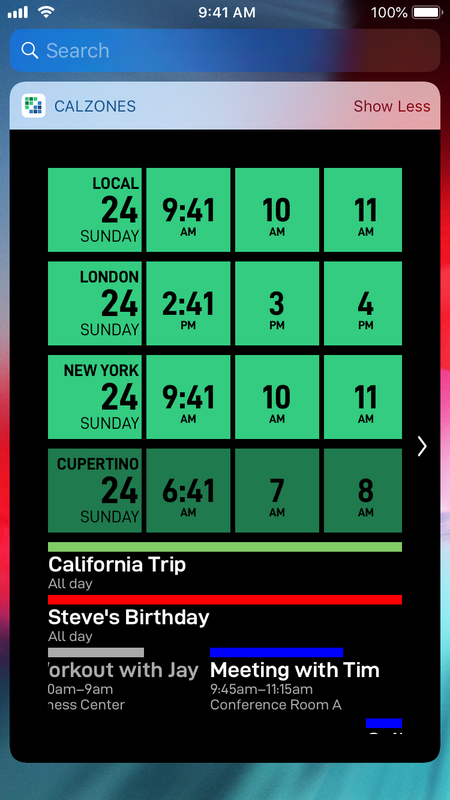 Today I’m delighted to announce a new app, CalZones, a timezone savvy calendaring application. 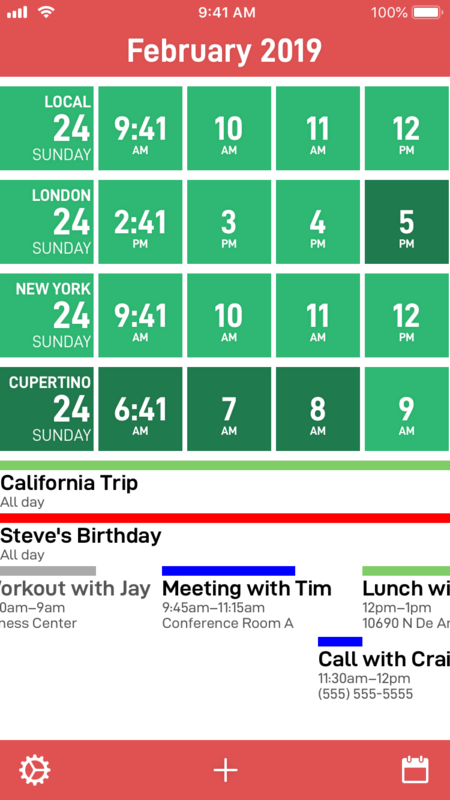 CalZones is a calendaring app built from the ground up to be smart about managing timezones. 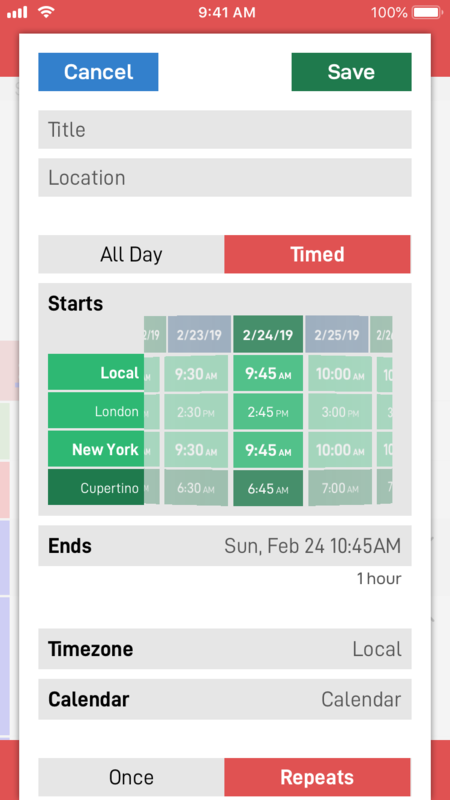 It starts by letting you choose a list of the zones that are relevant to you and then all aspects of the app tailor themselves into making it easy to coordinate between those timezones. The main timeline view shows you a comparison of the time in each of your locations for quick reference. Below this timeline your events are laid out to give you an easy, glanceable view of your upcoming events. Tap on any time shown to quickly create an event at the shown time and in the selected timezone. The calendar view provides a more traditional view to explore your events with. You can quickly jump to a particular day and see the events scheduled. Each event is expandable to see when the event is in each timezone, perfect for coordinating a meeting or call. The event creation view makes working out the time for a call super easy by giving you a time picker that is timezone aware and displays the chosen time across all your selected timezones. The Today Widget for CalZones provides two distinct modes. The compact view is a quick timezone converter utility, showing you the current time/date in your selected timezones. The expanded view provides the full functionality of the timeline right from your widget screen. 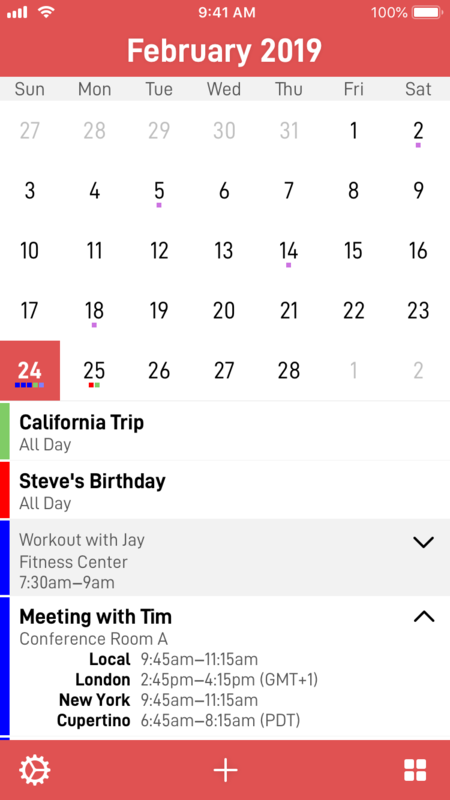 You can browse your day’s events or tap to create and edit events. 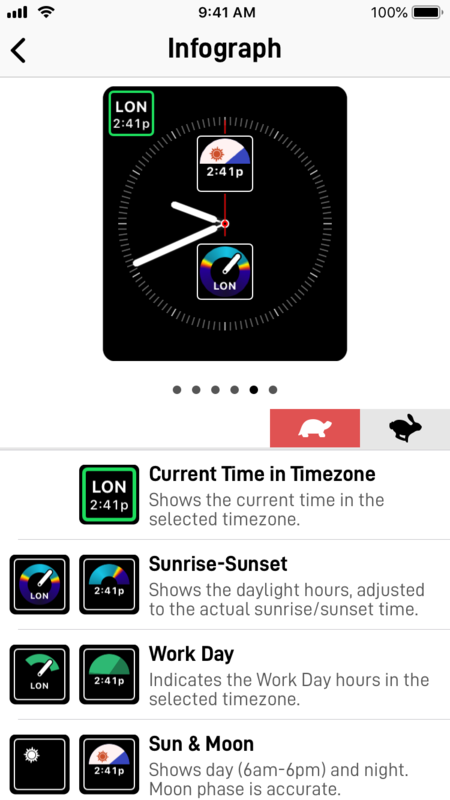 On the Apple Watch Calzones provides a rich timezone conversion tool. Turn the Digital Crown to compare the time in your selected places. Then once you find the time you are looking for you can tap any of the locations to quickly create an event at the time shown. Swipe to the right to see a list of your upcoming events all shown in one place. I hope you enjoy using CalZones and find it useful. It is available on the App Store for $4.99. I’m imagining a small device. Called something like the Apple Watch mini/nano (I’m actually quite fond of calling it the Apple Seed in my head). It would be physically much smaller than an Apple Watch. Have only a small display which essentially just displayed the time and your Activity rings. There would be no real ‘apps’ on it. Its primary purpose would just be to track your physical activity throughout the day. I could maybe see including the Apple Watch’s ‘red dot’ for notifications but wouldn’t expect to be able to respond to notifications from the device, only be made aware that there were things to see on your iPhone. I’m sure Apple has good reasons for not releasing such a device thus far, but the more I think about it, the more I really wish it existed. For both my own use and for the iPhone community more broadly. Battery Life: While the battery life of an Apple Watch is good (and gotten better each revision), the reality is that there is a huge difference in a device that needs to be charged once a week rather than once a day. I suspect there are some users who are reluctant to commit to adding another device in their life they need to manage and so are reticent to get an Apple Watch. Also, there are certain activities (for example, hiking or backpacking) where regularly charging is awkward and diminishes the utility of the device. Wrist size: The smaller model of Apple Watch is one of the smallest smartwatches available but even so is still not ‘small’ by any means. This is even more true with the Series 4’s 2mm increase in size. When you wear an Apple Watch it is a very big and bold component of your appearance. I’d love to be able to wear an activity tracker that wasn’t quite so substantial. Something that you could wear along with a traditional watch and it wouldn’t seem absurd. Not to mention the benefits a smaller size would present to those with smaller wrists for whom even the 40mm Apple Watch looks oversized. Cost: The Apple Watch is expensive, no way around it. It starts around $400 for the current model ($300 if you get an older one). That is a lot of money for something who’s purpose is to augment your $800+ iPhone. It isn’t an ‘impulse buy’, it is a thoughtful considered purchase. If Apple were to make a model that was more in the $99 - $129 price point I suspect it would massively open up the audience for the device. Durability: I’m often a bit worried about the ruggedness of my Apple Watch. They are generally pretty robust and resilient but there are lots of situations where I choose not to wear it out of concern that it might get scratched or broken. These are unfortunately also often the situations where I am being the most active and adventurous. A simpler device that was softer and didn’t feature a giant glass screen would make me much more inclined to be cavalier with the situations I used it in, especially if the cost were dramatically lower too. Simplicity: The Apple Watch is extraordinarily capable, and if I’m honest I think it might be a bit too capable. I think it is fair to say that I’m an Apple Watch power-user and even I don’t fully understand all of what it does or how to best use it. I suspect most of its users are barely scratching the surface of what it can do. Mostly just using it for notifications and activity tracking. A device that boiled down to just these essential features would present a much more easily explainable and less intimidating face. 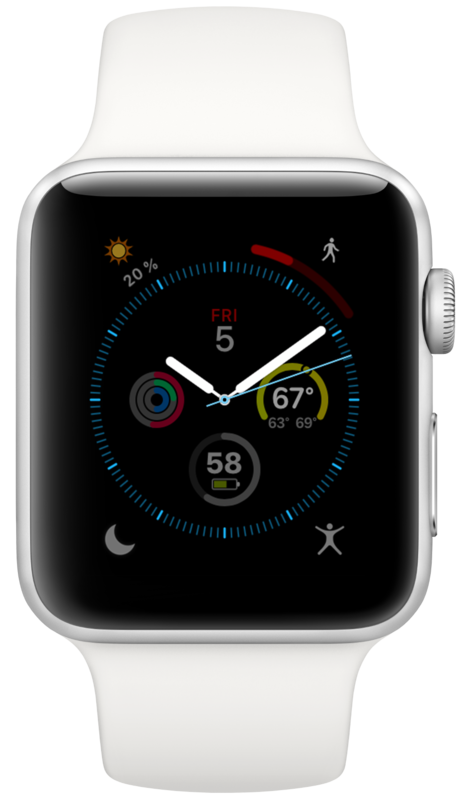 Adoption: The Apple Watch seems to have had a really good Christmas season, I observed a sizable jump in my users who have Apple Watches attached to their iPhones. But the overall adoption is still pretty low. Among the admittedly fitness oriented users of Pedometer++ I see only around a 17% adoption of the Apple Watch (up from 14.5% before Christmas). This means there is still a major contingent of iPhone users who don’t have one. Just based on my own looking at people’s wrists around town or at the gym this isn’t because many of them don’t want a fitness tracker, indeed FitBits seem to be popping up on more and more wrists these days. Every FitBit attached to an iPhone is a missed opportunity for Apple. Entry Point: I suspect that offering a low-end model of the Apple Watch would also have the benefit of gradually increasing adoption of the high end model. My Apple Watch has become an essential part of my day, useful in countless situations, many of which I wouldn’t have been able to guess before I got it. A simpler entry device could serve to get users comfortable with what wearing a device like this regularly can do for you. Then once you are used to it you may better appreciate what a higher end model can do and the benefits it would bring to your life. Accessibility: There is something that hits me a bit funny about the Health and Fitness marketing of the Apple Watch. I am extremely glad it is a focus for Apple and it is clear it is having a significant impact on the lives of its users. I see this both in Apple’s marketing as well as countless stories I hear from my own users who have found that fitness tracking can cause dramatic improvements to your health and wellbeing. However, this potentially life changing benefit isn’t accessibile to everyone but I wish it was. Maybe a simpler, cheaper, less capable device wouldn’t provide the full level of benefit that a fancier model can, but it would provide something. It would be great for more and more people to have access to a device like this. I doubt any of these reasons would come as a surprise to Apple. I’m sure they have good reasons for their current line up. All I can say is that I hope that what we have seen thus far is just the start, and we can hope for them to expand and diversify their line up moving forward. I’m reminded a bit about the iPod. Where Apple relentless pushed the device to be more and more accessible and broadly appealing. There was an iPod for any price and purpose. They weren’t afraid to cannibalize the sales of their higher end models by filling in the low-end. I’d love to see that bit of Apple history repeat itself. For several years now Apple has offered Phased Rollouts for app updates in the App Store. This lets you slow down the adoption of a new update to your users by limiting the number of users who are offered it as an automatic update each day. This is useful for when you are releasing a ‘high risk’ update or one that will make use of a new resource and you’ll like to be able to change fix or adapt to the update in a more gradual way. I hadn’t had a specific use for this until a recent set of updates caused me to try them out. For my app, Pedometer++, I needed to roll out a change to the step counting system that was really hard to be sure I’d got 100% correct. No amount of testing would eliminate this uncertainty so it seemed a good candidate for a phased rollout. According the the App Store Connect documentation here are the “offered percentages” for each day of the roll-out. These are the proportion of your userbase that will be offered an automatic update. Users can always do a manual update within the App Store. Additionally, you will have new users downloading your app and they will always get the latest version. Here is what I observed in practice. 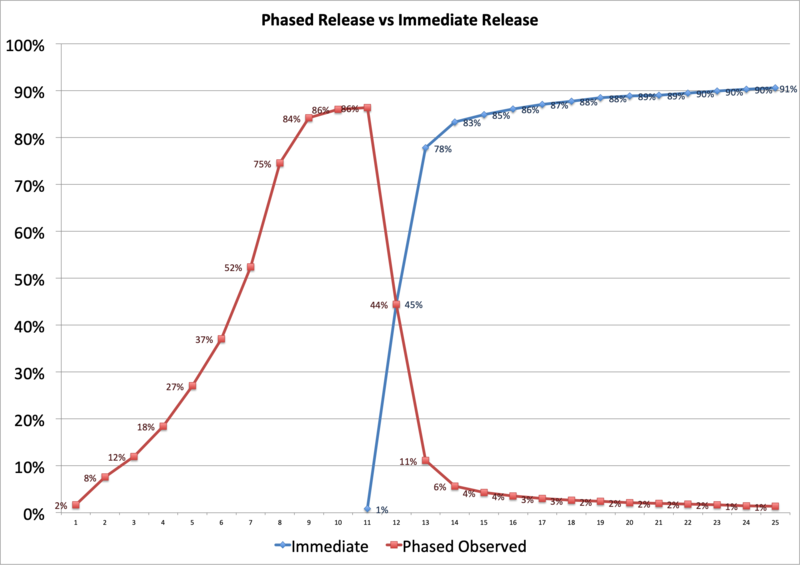 The following release after the phased one was a typical ‘immediate rollout’ which I include in the graph for comparison. I was very pleased to see the system work so well. The rollout was slow and measured. It let me find a few things I needed to fix before the update got out to all my users. Also remarkable to me is how quickly the ‘immediate rollout’ really is. With around 80% adoption in just a couple of days. 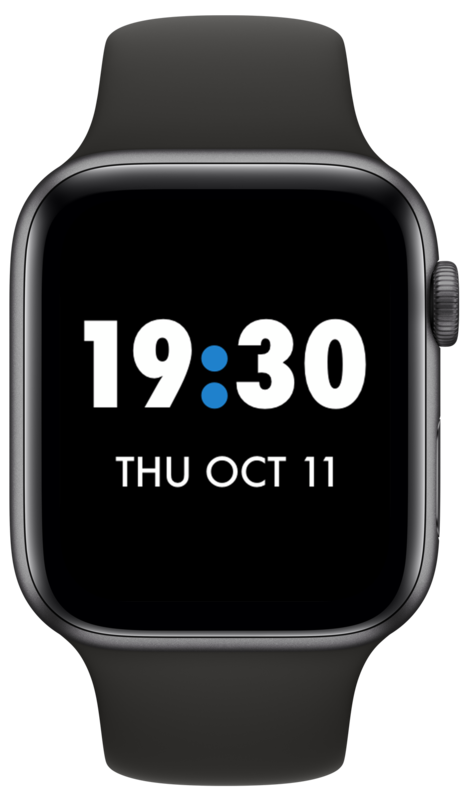 As likely comes as no surprise to anyone who reads this blog, this week Marco and I discuss our adventures in Custom Apple Watch faces and why we really hope they are coming to watchOS. 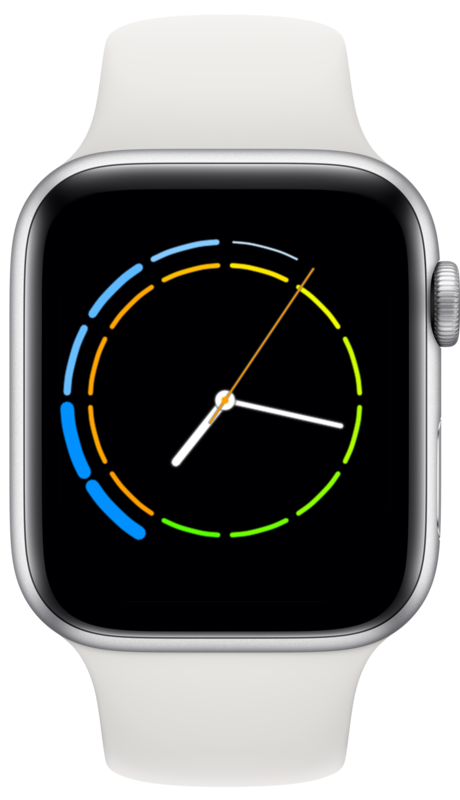 So last week I spent a lot of time working through ideas around making better complications for the Apple Watch Series 4. This showed some progress but is ultimately limited by the constraints imposed by the current watchOS watch face system. So when the broader discussion got to the point of talking about totally custom watch faces I was very interested. Especially when Steve Troughton-Smith worked out a little hack to hide the time from full screen watchOS apps. Now I was off to the races. 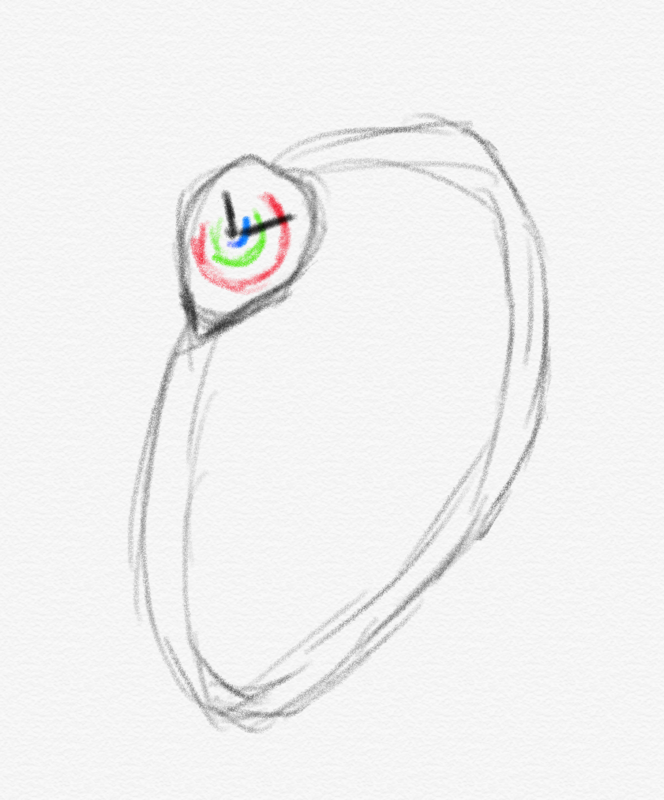 We don’t have a means to replace the actual watch faces on our watches but we can make watch apps that look like them and run those on my wrist. There is something delightful about solving a problem that is superficially so simple and constrained. The constraint leads to lots of opportunities for creative thinking. Ultimately you just need to communicate the time but how you do that can take countless different forms. It reminds me of the various ‘UI Playgrounds’ that have existed in app design. For a while it was twitter clients, then podcast players and weather apps. Here are a few of the designs I’ve come up with this week.. There are doubtless lots of issues and concerns with allowing developers to create third-party watch faces surrounding copyright, trade dress and copycats. Any App Store for these would likely need to thoughtfully structure itself to handle these. That said, however, I often find the best place to start when learning to design something is to at first copy from a master and then adapt and grow from there. It is a well trodden technique for learning to paint and I find it works well in digital design too. The face that seemed the best place to begin with is the Nomos Metro 38 Date. 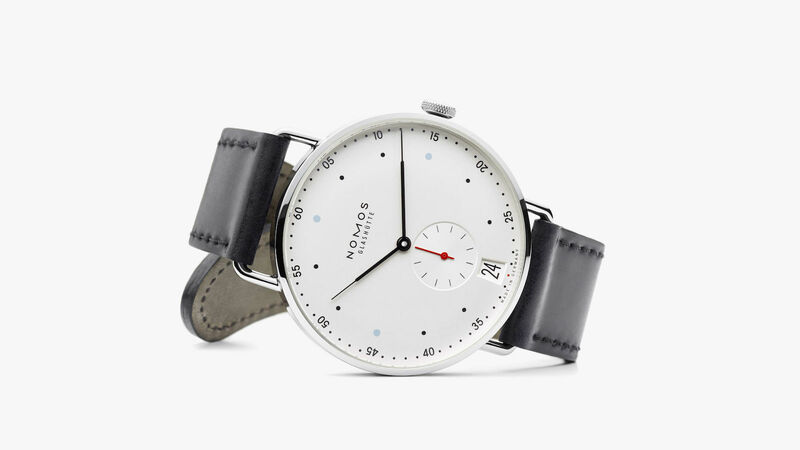 I have a couple friends who have Nomos watches and when I’ve seen them in person they always strike me as the kind of watch that if I ever wanted to own something fancy I’d gravitate towards. Simple, understated and gorgeous. It is by no means finished but building it got me comfortable with the process of making something like this. The inner ring shows the temperature for the next 12 hours (warmer colors are hotter, cooler colors are colder), the outer ring shows the likelihood of precipitation. So in this example, rain for the next 2 hours then tapering off until 1AM while the temperature is slowly cooling off. The second hand’s color shifts throughout the day with the current temperature. By separating the hourly forecast bands I didn’t even need to have indice marks for the hours since those are implied by the blank space. I really like the combination of utility and simplicity it allows. I’ve played with a bunch of other ideas during this little experimental period. Most got thrown out but a few still stick around for me. Like this super simple one that is just a big time and date. It always bugged me that I couldn’t make a face on any of the built-in faces that had a BIG time and then also the date. The closest is the Nike+ digital face but it offends me that I can’t change the top left complication away from a Nike app I never use. Something I didn’t really expect about this exercise has been how it has reframed my experience of raising my wrist to see the time. When Apple first introduced the Apple Watch in 2014 their tag line for the original version was “Apple’s Most Personal Device Ever”. And it’s true, the Apple Watch is profoundly personal, it sits next to your skin all day, literally listening to your heart beating. But it wasn’t until this week of perfecting my own personal watch face that I really felt like the watch on my wrist was truly mine. There is something sterile and compromising about choosing your watch face out of a fixed set of options. While the watchOS faces provide for a high degree of customization, there is something fundamentally different in being able to customize every single detail of the face. I started with a blank slate and was able to make the face look exactly how I wanted it. When displaying one of my creations it is now truly my most personal device ever. 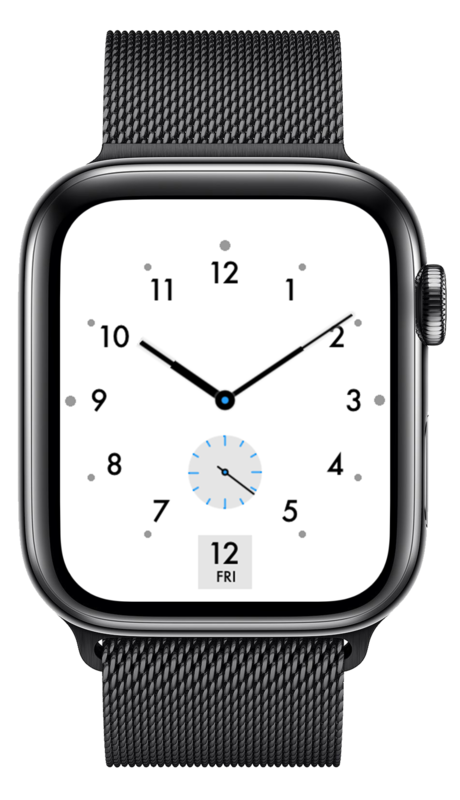 I have no idea if Apple will or should ever open up 3rd party watch faces for developers. That is a question far beyond my experience and expertise. But I do now know for sure that if they do, it would be a great boon for endearing the platform to its users. Letting them truly personalize their watch to their own tastes and whims. I hope that day comes, and until then I’ll continue getting better at making these, just in case.